Leicester City's summer transfer plans will focus on strong-minded players who work hard without the ball, says head of recruitment Steve Walsh. The club won the Premier League this season on a relatively small budget and with low possession statistics. Players will not be signed on ability alone, Walsh told BBC Radio 5 live. "It's about making sure the players you bring in are strong of character, and can do the tasks we ask them to do when we haven't got the ball," he said. Walsh, who is one of the club's two assistant managers in addition to being head of recruitment, agreed a new contract on Sunday, having been widely credited with finding bargain signings such as Riyad Mahrez, signed from French second-tier club Le Havre for £400,000 in January 2014. Leicester's squad as a whole was assembled for £57m, making it the cheapest of any in the top half of this season's Premier League. Walsh said: "If you just needed to get all the best players, talent scouting would be easy, wouldn't it? You've got to look at the players maybe through different eyes and see what they can achieve. That's the skill. "We have a DNA. For me, it's not just about their ability on the ball. It's what they're prepared to give to the team when we haven't got it. "Obviously, the character of the person shines through. If you're prepared to put in a shift when we haven't got the ball, that says a lot about you in terms of your work ethic." Arguably Leicester's most significant signing last summer was that of French midfielder N'Golo Kante, brought in from Caen for £5.6m. 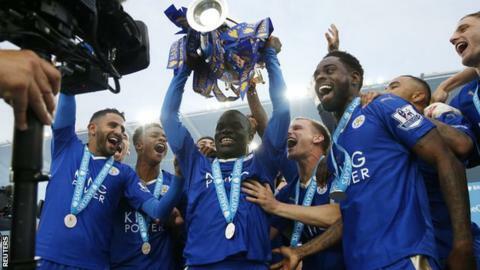 Described as the best midfielder in this season's Premier League by former Manchester United manager Sir Alex Ferguson, Kante's ball-winning skills were key to the fast, counter-attacking style that has brought the title to the King Power Stadium. The midfielder arrived shortly after the appointment of Ranieri, after Walsh persistently urged the Italian to secure a deal by telling him: "Kante, Claudio, Kante." "We did have that conversation," Walsh said. "But obviously he took my advice, brought him in and the rest, as they say, is history. "People think we play with two in midfield, and I say 'No. We play with Danny Drinkwater in the middle and we play with Kante either side, giving us essentially 12 players on the pitch.'" Mahrez, Kante and prolific striker Jamie Vardy are the three players most often cited when illustrating the success of Leicester's recruitment. But for Walsh, a Lancashire-born former schoolteacher who scouted for Jose Mourinho and who has been with the Foxes in two spells since 2008, the real satisfaction has come in building a title-winning squad from scratch. "Sven Goran Eriksson brought in Kasper Schmeichel in 2011," Walsh said. "But apart from him, and the kids who have come through the academy, such as Andy King and Jeff Schlupp, we scouted them all. "Christian Fuchs, the left-back who we got on a free transfer from Schalke, scored against Real Madrid in the Champions League at the Bernabeu last year. He's captain of Austria. He wanted to come. It was a no brainer." Walsh admits that he and fellow assistant Craig Shakespeare were "upset" when manager Nigel Pearson was sacked by Leicester at the end of last season, and were not sure what to expect when Ranieri took over. Pearson and Walsh had worked together for nine years, firstly when the former Sheffield Wednesday captain was assistant manager at Newcastle, and then through his two spells as boss at Leicester either side of a stint at Hull. "I had big ties with Nigel, and both Craig and I were very upset when he left," Walsh said. "They chose Claudio, for whatever reason, and it's been a fantastic success. We've all gelled and worked together. "Claudio knows what he wants. I think that's the easiest way to put it. He definitely wants to keep a clean sheet and he definitely wants people to defend. "It was a while before he kept a clean sheet, hence he put together the idea of going out for a pizza. That tells a tale, doesn't it?" Ranieri's willingness to treat the players as grown-ups led to him giving them a week off in February when they had a gap in their fixture list, which striker Vardy feels was key to their title win. The England forward said: "It was a great idea. I remember sitting on a sun lounger in Dubai and in the same hotel, Sunderland were there running up and down the beach doing fitness. For me to be relaxing while they're doing the training was quite nice." Leicester's success was aided by the fact that Ranieri managed to keep his players relatively free of injuries - and by a light fixture list. Ranieri's team have played only five cup ties all season, while fellow top-four sides Tottenham and Arsenal have had 15 each, and Manchester City 21. Walsh has acknowledged that Leicester will need a bigger squad to cope with the demands of a minimum of six Champions League fixtures next season, in addition to domestic commitments. "I think we're going to need more personnel," he said. "We'll go from playing one game a week this year to two games a week. That, in itself, says you need more personnel on the ground. "But we're in the Champions League now. It's fantastic for Leicester to actually be in the Champions League. Liverpool haven't won the Premier League. That says it all, doesn't it?" Vardy, the Football Writers' Association's player of the year, has indicated that the prospect of Champions League football will keep him at Leicester, even if other clubs try to sign him. "We've just won the league and will be playing in the Champions League next year," the forward said. "I am happy here."